You are here: Home / 2018 / November / 11 / Cartoon/Anime Ride! 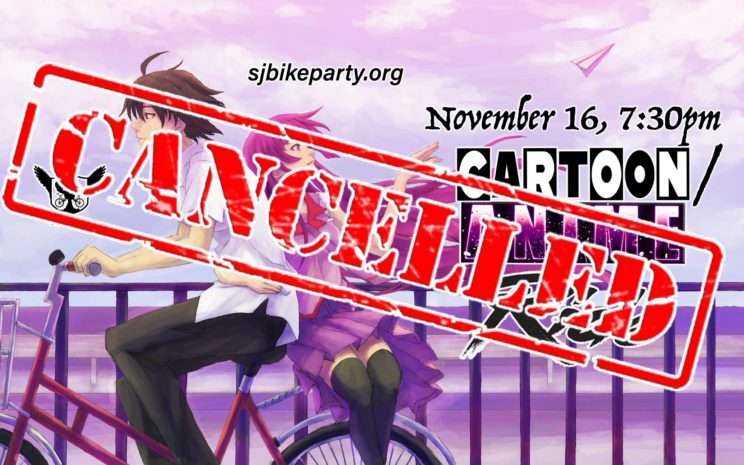 Nov 16 Cancelled! 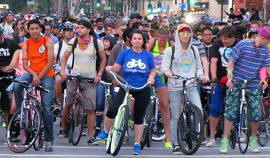 San Jose Bike Party has held our big group rides on the 3rd Friday of each month – rain or shine, everything but snow – for the last eleven years. But, for the first time, we’re cancelling our ride. 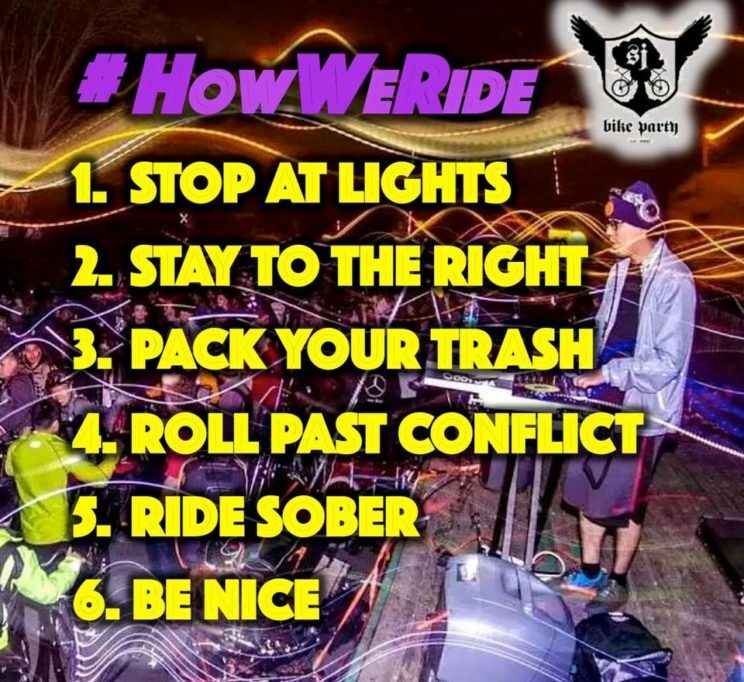 The San Jose Bike Party HUB has been closely monitoring the air quality levels all week discussing whether or not the ride could happen. Like a lot of you, we’ve learned exactly what air quality ratings are; as well as what particulate matter is and how horrible it is to our lungs just breathing it in – let alone while riding bikes. You don’t need to become a research scientist to know that though – you’re already well aware of how hard it is to breathe! Please be careful with your lungs, friends! It’s a bummer to cancel the party – but ultimately, it’s because of a lot of tragedy and horrific loss. Count your good fortune. Hug your friends and loved ones. Have a great Thanksgiving with so much to be thankful for…and start planning your costumes for The Krampus Ride in December. 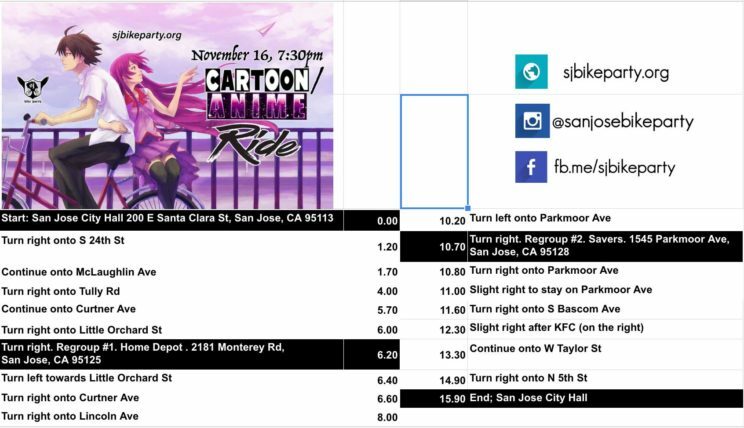 San Jose Bike Party presents The Cartoon/Anime Ride. Cosplay as your favorite animated character and join us on Friday, November 16 for our #3rdFriday monthly ride! Will we cancel the ride; or shorten the route? MAYBE. Due to the devastating fires ravaging our state, the air quality is really poor (obviously). We have been monitoring the Particulate Matter Numbers via the Environmental Protection Agency all week. (That’s fancy talk for “How Thick Is The Nasty Junk The Air?”) Forecasts vary; and change with the onset of additional fires. We already have a back-up plan, and a back-up back-up plan hoping to keep the party rolling. So, check back here on Friday after 1pm for the final update. 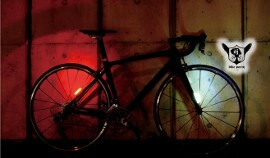 As of right now, THE RIDE IS A GO – and at the full sixteen miles. –>The temperatures are expected in the low 50s. Please bring lots of extra layers to stay warm! 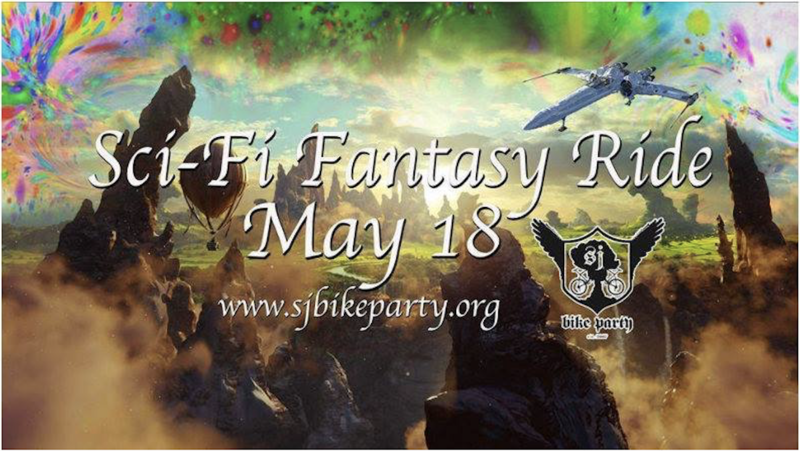 Again….any change to the event including shortening the ride, changing the route, or cancelling the ride altogether will be finalized on Friday by 1pm. The event will be updated; and we’ll spread the word. We’re bummed about having to tone down the party; but the root of the air quality is a lot of tragic, actual loss. There’s a good chance you know someone who lost everything; or they’re a friend of a friend. Our hearts go out to the tens of thousands of people suffering from the aftermath fires throughout our state. We send them, and the emergency crews working tirelessly, all of our strength. Remember to check back on Friday after 1pm! Be visible and bring some water. We’re expecting Cooler weather! We also encourage cyclists to ride to the start rather than drive; reducing auto traffic and parking demand. Please look at the route and print it out.